Do you remember reading a poem in a high school English class about a “just-spring” day when the world was “mud-luscious” and “puddle-wonderful”? Can you remember further back, when you were out and about on a day like that and maybe you got a bit mud-luscious yourself in those wonderful puddles and had to be hosed off before your adults would let you indoors? Then maybe you will be glad to know (as I was) that for many people around the world who work with children, June 29 is International Mud Day. International Mud Day is relatively new—“born” from a conversation between educators at a 2009 event sponsored by the World Forum Foundation, which is focused on the well-being of young children worldwide. Mud Day is, essentially, about giving children (and adults) permission to get messy. In fact, it’s part of an international movement to encourage the kind of play that “says yes to the mess.” For example, in the United States, nature playgrounds are being designed that incorporate such elements as rocks and lake water, and a new preschool in Japan has been built to accumulate a large indoor rainwater puddle where children can play. In my childhood, it was expected that we’d get pretty grimy playing outdoors. But somehow, that seemed much less typical by the time I started parenting. True messiness came to be more of a special occasion than an everyday occurrence. My husband and I didn’t object to a little dirt and grit on the kids, in theory. But a muddy mess requires cleaning up. Sometimes, more time goes into the cleanup than into getting dirty. And juggling multiple schedules, including my own part-time work, often left me with the sense that we didn’t have time for those messes. We had places to go, things to do. Things that required clean children. One time, though, when we were home for the day, my then 5-year-old son, William, fingerpainted himself with wet topsoil from head to toe. I was watering the aged American elm in our back yard, trying to prevent drought stress, while he played with the tire swing that hung from a low branch. Virtually nothing grew in the well-shaded earth below that tree. Before long, William was “accidentally” up to his ankles in the black goo created by my watering project. Then he sat in it. I rescued his shirt and put it aside. Then he indicated that he’d like to cover himself with mud. I hesitated, but decided “Why not?” After all, the hose was right there, so he could easily rinse off. Neither of us can remember how long he was happily immersed in puddle play, but he still recalls smearing his arms and chest and getting thoroughly coated. My guess is that the experience is still memorable 25 years later partly because it was very satisfying fun and partly because he was astonished to have permission. Knowing that children are naturally inclined to find joy in puddles and mud, what makes us say no to that kind of play? Not all of our refusals are unreasonable. Some are based on short-term concerns: “You’re wearing your good shoes.” “You just had a bath.” “Your parents will get upset if I let you.” “I’ve got no way to clean you up.” For some parents, the financial burden of replacing stained clothes or shoes makes them reluctant to allow messy play. 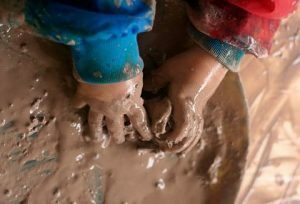 Other concerns such as worry about germs, chemicals, and other hazards have merit in some situations, but research suggests that fear of what’s in a child’s chosen mud puddle may occupy more space in adults’ minds than it deserves. Of course adults need to be mindful of where the mud comes from. 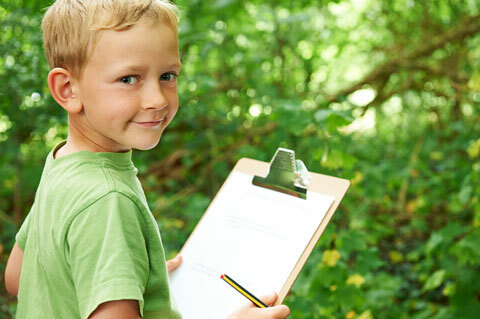 But unless children are trying to play in a septic field, alongside a highway, or in an area that’s been recently sprayed with agricultural chemicals, we can let go a little. Our children are not living in mud puddles. If they don’t swallow a bunch of it, if we securely bandage any cuts they have beforehand, if they can bathe when they have finished, we can let them play there. Send home information about the value of this kind of play. Announce mud puddle play days well ahead of time. Keep on hand a supply of used clothing for children to wear during any messy play. Garage sales and rummage sales are good sources. Make head scarves, shower caps, or other head coverings available before mud puddle play and encourage children to wear them. Invite family members to participate in mud puddle play at school. Having a designated time for messy play, such as International Mud Day, seems like a good way to raise global and community-wide awareness of how children benefit from that sort of experience. If you want to find out more, you can periodically check the World Forum Foundation’s International Mud Day website for events and other information. We spent much of Mud Day 2015 watching our grandsons and their cousin play in a motel swimming pool. I hope that next year—June 29, 2016—we’ll celebrate together with mud! To read a celebration of the spirit of messy outdoor play (at least that’s how it seems to me), read the entire e.e. cummings poem mentioned in the first paragraph, titled [in Just-].